Human biomechanics is the study of how the anatomy (the muscles and bones) of the human body is put together and the mechanics (the nuts and bolts) of how the human anatomy works together to create movement. Rider biomechanics focuses on how the rider’s anatomy functions and how it work’s to connect with the horses’ movement. How connected the rider is to the horse’s movement is dependent on riding style. There are two common riding styles; one is to ride from strength and the other is ride from balance. 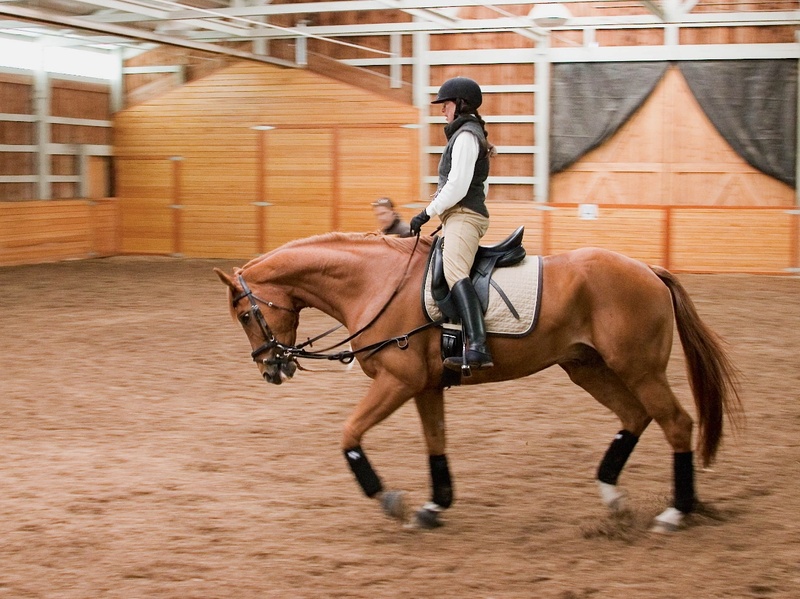 When trying to ride from strength by gripping with the legs or holding on with the reins, the rider becomes stiff and is not able to connect to the horse’s movement. A stiff rider is unstable and can more easily fall and the stiffness hinders the horse’s natural movement. To connect to the horse’s movement, a rider needs to develop a balanced and supple seat. When riding in balance, the rider is able to move his arms and legs independently and is able to relax and connect to the horse’s movement. As a rider becomes more aware of their own body, they can work towards controlling their body to effectively connect to their horse’s movement. The understanding of basic human anatomy and biomechanics helps the rider to develop a balanced seat. To be able to move in connection to the horses’ movement, the rider needs to have a supple seat and relaxed limbs. This requires that the rider rides from balance and that balance is dependent on a grounded and strong core. Grounding one’s trunk can be thought of as the feeling of having a weighted ball settled in their pelvis. Riders need to be able to stabilize their trunk (their core) by strengthening their abdominal and back muscles and to be in a balanced postural alignment with ears over shoulders, shoulders over hips, and hips over heels. Amazing how much walking and riding have in common! There are many learning methods, but most methods fall into two main categories; the command–oriented method and the experience-orientated method. The commands are quick and precise. This type of instruction is great when working with beginners and when safety issues arise. Deep practice is about all about passion and commitment. Deep learning comes through concentration, by going inward, and by learning from mistakes. The idea is to learn from mistakes and to turn failure into skill. Through these methods of learning, task-based exercises and “deep practice”, the rider is able to discover her own balanced seat through experimentation and it becomes easy for her to make subtle adjustments as needed. The rider’s internal source is developed for feeling when the body is out of balance or off of center. The goal is for the rider to feel balanced and centered over the horse without mental and physical tension. Stewart, Daniel. Ride Right. North Pomfret: Trafalgar Square Books, 2004. Meyners, Eckart. Rider Fitness: Body and Brain. North Pomfret: Trafalgar Square Books, 2011. Von Dietze, Susanne. Balance in Movement. North Pomfret: Trafalgar Square Books, 2010. Glosten, Beth, MD. The Riding Doctor. North Pomfret: Trafalgar Square Books, 2014. Dennison, Paul E., Ph.D. and Dennison, Gail E. Brain Gym. Ventura: Edu-Kinesthetics, Inc., 1994. Promislow, Sharon. Making the Brain Body Connection. Vancouver B.C. : Enhanced Learning and Integration Inc., 2005. Hannaford, Carla, Ph.D. Smart Moves: Why learning ins not all in your head. Salt Lake City: Great River Books, 2005. Hassler-Scoop, Jill K. Equestrain Instruction: An Integrated Appoach to Teaching and Learning. Colora: Goals Unlimited Press, 2000. Coyle, Daniel. The Talent Code. New York: Bantam Books, 2009. Leonard, George. The Keys to Success and Long Term Fulfillment. New York: A Plume Book, 1992. Gallwey, Timothy W. The Inner Game of Tennis. New York: Random House Trade Paperbacks, 1997.